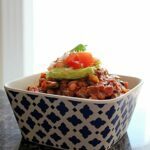 If you’ve been following the blog for a while, you’ll have read my 30 Day Vegan Challenge post, if not, definitely check it out. I explain why I’m taking the challenge and introduce a great book, that I truly believe everyone would benefit from reading. 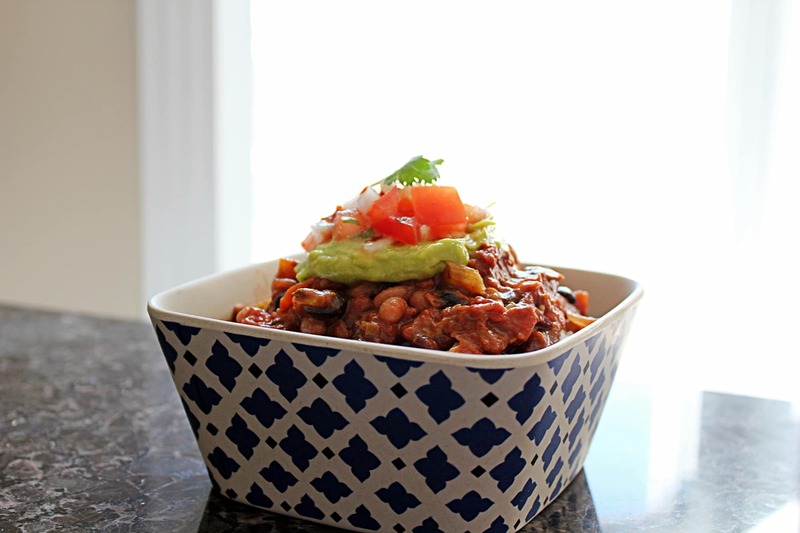 Today, on day 2 of my 30 Day Vegan Challenge, I’m sharing with you this unreal chili. Here’s the lowdown on chili, Kevin doesn’t like beans, like at all. He would pick them out every time I made chili, so I don’t even bother making it. Or should that say ‘didn’t’. My mom makes a mean beef based chili, so this was a real challenge, to make it meatless! 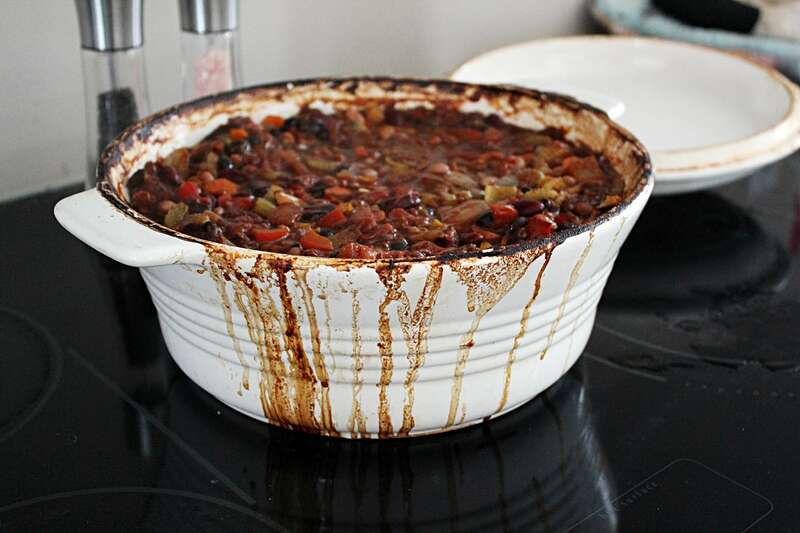 I prefer to use dried beans that have been soaked and cooked. It gives me a bit more control over the texture of the beans this way, as I like them a little on the al dente side and I find canned beans are quite soft. 3 cups dried beans soaked overnight - I used 1 cup navy, 1 cup kidney, and 1 cup black beans. Rinse and drain soaked beans, set aside. Add peppers, onion, celery, carrots, and garlic to a large pot with olive oil and sautee over medium heat. Once the aromatics start to soften up and the onion begins to become translucent, add the jalapenos, cumin, chili powder, pepper flakes, cayenne, and salt and stir well to combine. Transfer to large Dutch oven. Add both cans of tomatoes, and all beans to dutch oven and stir well to combine. Bake, covered at 350f for 30-45 minutes, until the chili is hot and bubbling. Carefully mix in the chopped chocolate and cinnamon - until the chocolate has melted. 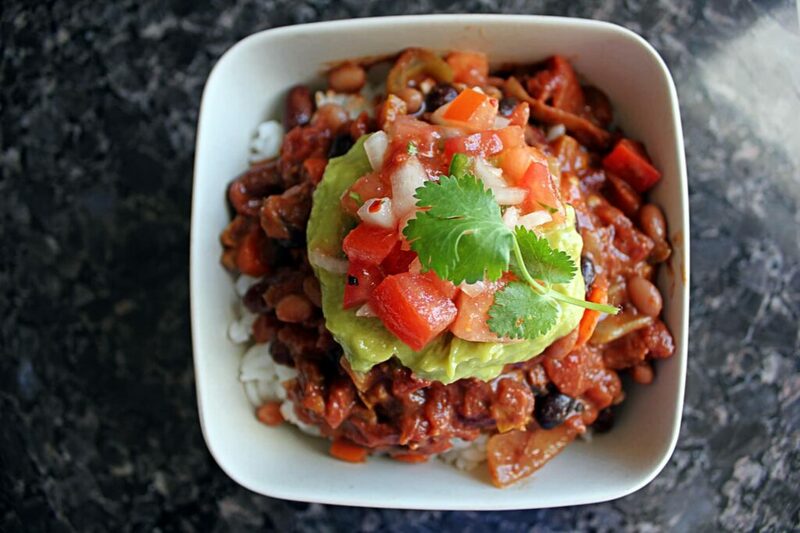 Serve over a bed of rice, topped with guacamole and Pico De Gallo.